A severe mold problem in your bathroom is commonly caused by excess moisture. Many times this is the result of a broken or nonworking bathroom vent exhaust fan. Whenever you take a hot shower in a small enclosed bathroom, moisture is produced. If that moisture is not being expelled out of the bathroom, the moisture has nowhere to go and will settle on the walls and ceiling. When this happens the walls and ceilings become wet and will attract rapid mold growth. The first thing to do if you have mold growth conditions, is remove the mold off of the walls immediately. Once you remove the mold from your walls then determine what is causing the mold to grow in your bathroom. 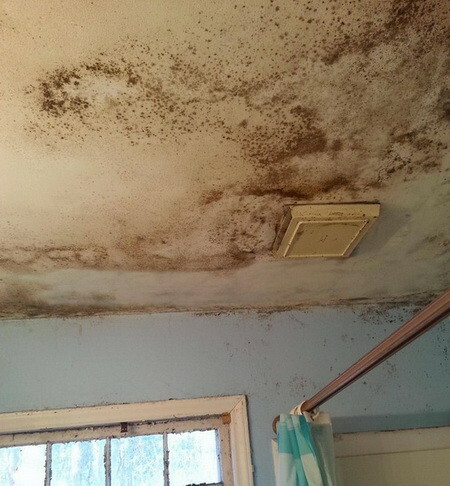 As we mentioned previously, the most common reason mold will grow on your bathroom ceiling and walls is because of a broken exhaust fan. You will need to determine if your bathroom exhaust fan is working properly. Flip the switch on the wall and listen to determine if the exhaust fan is turning on. If you do not hear any noise, then most likely it is not working. You can carefully remove the vent cover and see if the fan is turning. If it is, then it may just be so full of dust and dirt that it has become inefficient. You can clean it by using a wand style vacuum cleaner but make sure the fan is NOT on when doing this. Once the exhaust fan has been cleaned out, test it again to make sure it is operating efficiently. In some cases (many people taking a shower in a short period of time), you may need to upgrade your fan to something with a higher CFM (cubic feet per minute) to remove the moisture faster. You can determine the total cubic feet of your bathroom by taking the square footage X ceiling height to get the total cubic feet. Here is an example: A common bathroom measures 12 feet wide and 14 feet long and has 7 foot ceilings. The math is done to find cubic feet: 12 x 14 x 7 = 1176 cubic feet. NOTE: It is recommended to have the air changed out 8 times per hour in a moisture rich bathroom. So once you determine the cubic feet of your bathroom, you can see how many CFM’s you will need to remove the moisture and prevent mold conditions. 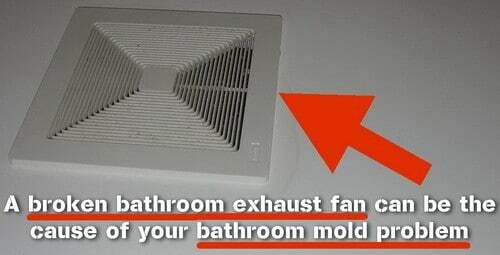 A broken bathroom vent fan could be causing your BATHROOM mold problem! If you have determined that your exhaust fan is NOT working, then it is best to not take chances and replace the bathroom vent exhaust fan with a brand new one. Replacing the fan is fairly easy and almost anyone can accomplish this in under an hour. Open a bathroom window to help vent out the moisture. Open the bathroom door after you are done in the bathroom to assist with venting the moisture. Make sure to clean drains that are showing signs of slow water drainage. When painting or repainting your bathroom walls always use a semi-gloss type of paint instead of flat. If you have a shower curtain, don’t leave it bunched up after showering, stretch it out fully to help it to dry faster. Clean your bathroom thoroughly every 7 days with a strong bathroom cleaner. Make sure the toilet, sink or any other plumbing coming from the walls are not leaking water. Do you have any tips for us? Please leave a comment below so we can share it with our other readers.